Our 5-part series is a “how-to” guide for moving up to your next home with as little stress as possible. Whether it’s your first time moving up or you’ve done it before, this series is a great resource. When you are ready for a new home but also have one to sell or want to rent-out your current home, the stakes are much higher. This time around, you’ve got more to think about, plan, and “get right” then when you bought your first home. 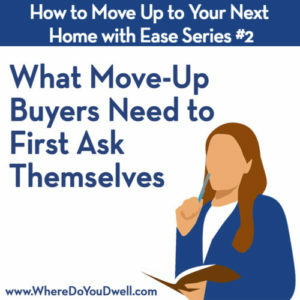 In this second article for the series, you’ll start exploring what you expect for this next home with two key questions. You’ve already decided that it’s time to move, but what do you need and want this time around? For this home purchase, you want to be MORE methodical and purposeful than when you bought your first home. That’s why we tell our clients to start thinking about buying your next home well before you need to be in that new home, ideally at least a year. It will be time well spent since it allows you to fully understand all of your particular reasons for moving, and you’re less likely to make any regrettable decisions. If this is your “forever” home, maybe waiting a year to have more money to get everything you want is the answer. If you plan on only living in this next home until your kids are off to first grade, then maybe your next home is just a 5-year home with needs and wants that match that time period. YOU get to decide how long. Once you do, then the answers to the rest will come more easily … but decide how long FIRST. This answer will help you decide what to compromise on and what you absolutely must have for this next home. See how it follows the first question?! It can also influence the timing of your move. If you are moving for the schools and your kids are starting school next year, you need to hustle. You’ll need to pick up your pace, but still not make any rash decisions … please! If your kids aren’t school aged for a few years, then you can take this process more slowly, which we recommend. If you are moving for schools, then your commute time might increase or you might need to get a smaller-sized home than you initially wanted. These may be okay because your #1 driver for moving is “schools,” and you’ll compromise on the rest to get into that school district. “Moving for schools” is just one example of a #1 driver for your next move. You may want to move for other reasons, such as having a shorter commute, to be closer to other family members, or to have better neighborhood walkability. Whatever IT is, your answer will make it much easier to decide on what you won’t and what you can compromise on. Remember, no matter your budget, buying your next home is a big game of give and take. Answering the two questions above FIRST — before you ever spend a Sunday at open houses –will make the rest of this process much more effective and successful. Take as much time as necessary on answering these two questions, even well BEFORE you’ve made the decision it’s time to move. Now that you’ve answered these two first questions and are very clear on your answers, the fun can start! It’s time to brainstorm. Make sure to include anyone who is going to live in this next home. You want their input on what they would like to have this time and what they really don’t want to deal with ever again. Some things may be more cosmetic that can easily be changed in a new home, but it’s still good to get it all written down somewhere. This is beyond your #1 driver for moving (see above). You know what nags at you, right? Maybe it’s lack of storage, maybe it’s not enough yard space. These are things that you aren’t moving FOR, but want to make sure you aren’t constantly being annoyed about in your next home. We also recommend walking around your home and neighborhood with fresh eyes to really see the pros and cons. Some ideas to get you thinking when looking at your current home: layout is not open concept or layout is too open concept; busy street; too much or too little yard; too many stairs or levels; lack of kitchen counter space; not enough storage space; no parking; no garage; no walkable conveniences so need to drive everywhere; noisy neighborhood with too many late-night restaurants; too far from neighbors or too close to neighbors; too much of a fixer-upper; too old; too modern, etc. What do you need now that you didn’t before? What about 5 or 10 years from now (or however long you’ve decided you will own this next home)? Everyone (and every family) is at different stages of their lives with evolving needs and wants. This next move should address any new and upcoming stages. Maybe now you need more space for entertaining, a home office, outdoor space to garden, a playroom, more bedrooms and bathrooms, more storage, better schools, a bigger kitchen. Maybe you are downsizing and you need to make sure there are no stairs. Whatever YOU decide, make sure you’ve thought through everything that could possibly come up during the time period you plan on living in this next home. Also, don’t get caught up in what all your friends or any other family members say. Decide what’s right for you and only your immediate family and make your home-buying choices accordingly. A word of caution: No Open Houses! Note that none of the steps above involve you looking at homes or wasting time going from open house to open house all day on Sunday. Wouldn’t you rather be brunching? In fact, we tell clients NOT to look at any homes at this stage of the game. This is the “thinking stage” of buying a home. When our clients want to start looking at homes too early in the process, it causes MAJOR problems. We know it’s exciting to see homes, but truly, you’ll be doing yourself a disservice and get side-tracked if you start looking at homes too soon. We’ll let you know when it’s time, but not yet. We promise if you follow our steps, looking for a home will be much more fun and rewarding. So, resist the temptation and just think and talk about the questions above. That’s all you need to do in this first step. It may not feel like you are making progress because you aren’t “doing” anything, but taking time out to think and plan your reasons for a move will make the next three steps so much more enjoyable. Now that you’ve thought more about what you want and need for your next home, it’s time to explore how you’ll pay for it! It’s easier than you think, so stay tuned for The Big Move-Up Question: How Do You Buy and Sell at the Same Time?